Egg Bowl Preview: Can Ole Miss Pull Off The Upset And Become Bowl Eligible? Football fans are going to be in luck Thursday night. If they want to watch the next installment in one of the more historic rivalries in the NFL (Washington Redskins vs. New York Giants) they can. But if they would like to watch a different and even more historic rivalry game they can. This one will feature a pair of talented teams, should be competitive and will be incredibly entertaining. What game is this? It would be the Egg Bowl, or the Battle for the Golden Egg, between the Ole Miss Rebels and the Mississippi State Bulldogs. The name may be a little odd, but the game has been around for over a century. It was first played in 1901, went on a short hiatus after the game in 1911, but returned in 1915. Since then, it has taken place every year but one (1943). But why go with such an odd name? Well—when the trophy was introduced back in 1927 it was intended to be a brass, football-shaped thing mounted on a wooden base. Back then, footballs were more rounded than they are now. They looked a lot like eggs. The name didn’t come up until a writer suggested it in 1979, and for some strange reason, it stuck. Like every other rivalry game in college football, winning this one can make or break a season for a team. A losing season can be forgiven if this game is won. But this season, the saying is true in a literal as well as metaphorical sense. Ole Miss enters the game with a record of 5-6. To become bowl eligible, they have to win. But taking down Mississippi State is not going to come easy. Mississippi State is the prototypical SEC team. They win games by running the ball well and playing defense. But, while he is just an average passer, Nick Fitzgerald can get it done in the passing game. He is one of two players in college football this season to have 6+ games with 100+ yards rushing and passing (Louisville’s Lamar Jackson is the other). But the Bulldogs would rather see their leading rusher team and Aeris Wiliams (204 carries for 944 yards this season) eat up the clock running the ball and keep the Ole Miss offense from taking the field. When the Rebels offense does take the field, they are capable of putting up some serious points. Jordan Ta’amu has done a great job at quarterback in relief of an injured Shea Patterson. In four starts, he has averaged 339 yards a game and completed 70 percent of his passes. While he isn’t a run threat like Fitzgerald is, he can make some magic happen with his legs. But it is worth noting that his stats took a hit his last time out against Texas A&M. The Ole Miss offense started out well against the Aggies (300+ yards and a 24-21 lead at the half). But they failed to adjust to Texas A&M’s defensive adjustments and gained only 66 yards in the second half. Texas A&M was able to put some serious pressure on him in the second half and disrupt the Ole Miss offense completely. 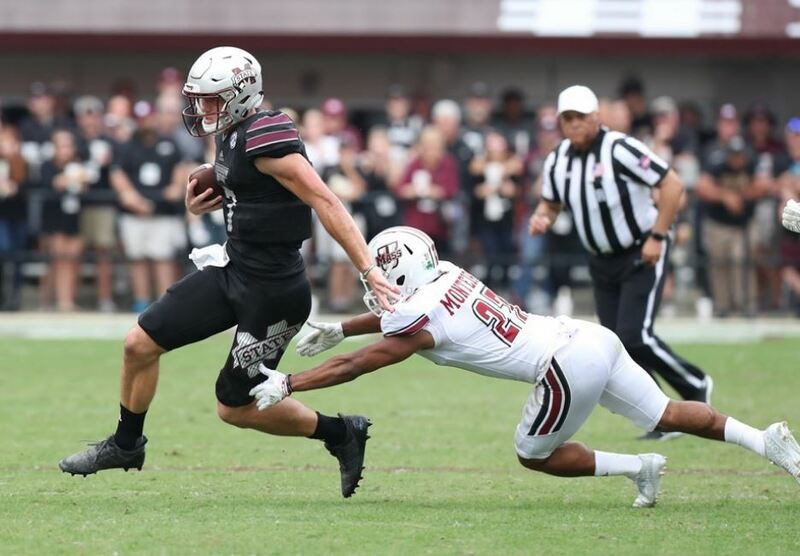 Mississippi State’s defense is much better than Texas A&M’s, so if the Rebels are going to pull off the upset, the offense has to get on track early and stay on track. 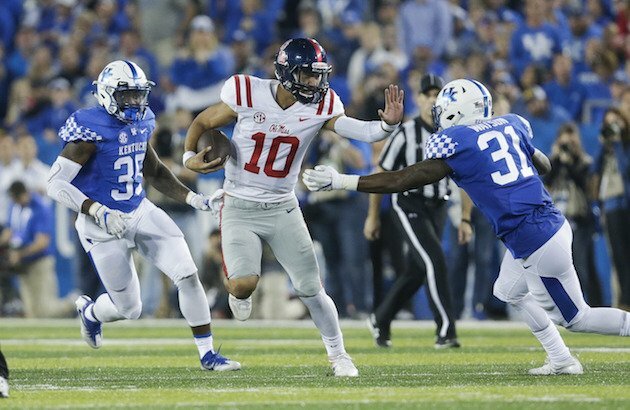 The Ole Miss defense is not very good, so it will need the offense to stay on the field and put up points on most if not every drive. That means Ta’amu needs to be as accurate as ever. They’ll need running back Jordan Wilkins needs to have a big day, and wide receiver A.J. Brown can’t drop balls (like he did against Texas A&M). But don’t expect it to happen. Ole Miss has a good offense but does not have enough of a defense to stop Mississippi State. Oddsmakers have made Mississippi State 16-point favorites. It would be nice to say Ole Miss can cover the spread, but their offense does not have enough firepower to overcome the Bulldogs defense.